We continue with the Awataguchi main line which was succeeded after Kunitomo by his son Norikuni (則国). The Kotô Meizukushi Taizen says that he was born in Jô´an four (承安, 1174) and that he died in Ryakunin one (暦仁, 1238) at the age of 65. Traditionally he is dated around Jôkyû (承久, 1219-1222) although some put him around Katei (嘉禎, 1235-1238), that means with Norikuni, we are slowly approaching mid-Kamakura. His first name was Tômanosuke (藤馬允) and like his uncle Kunitsuna (国綱) and his cousin Kagekuni (景国), he was part of the Oki-goban-kaji group. It seems that Norikuni has focused more on the production of tantô, or at least he is the early Awataguchi master of whom the most tantô are extant. But we are lacking a sound quantitative evidence base to say for sure what his main focus was and if the increased tantô production started with him or if the tantô production increased at all at a certain point in time or if there are just no such blades of the earlier smiths extant. To my knowledge, there are four signed Norikuni tachi going round, the most representative one being the kokuhô that was once a heirloom of the Ikeda (池田) family, the daimyô of the Tottori fief (鳥取藩) of Inaba province (see picture 1). This blade keeps despite of the suriage some of its originally deep koshizori, features a ko-kissaki, and is overall quite elegant and of a very harmonious tachi-sugata. The kitae is a very dense ko-itame with fine ji-nie and chikei and appears as nashiji-hada and the hamon is a ko-nie-laden hoso-suguha-chô with a little shallow notare sections that is mixed with ko-midare, ashi, yô and frequent kinsuji. The bôshi is sugu and shows a ko-maru-kaeri with kinsuji. In general we can say that Norikuni’s interpretations are a hint more nie-emphasized than that of his successors Kuniyoshi and Yoshimitsu. The tang is as mentioned suriage but its original katte-sagari yasurime can still be made out. The niji-mei is preserved at the very tip of the tang. Following the kokuhô, there are two tachi of Norikuni that bear the status of jûyô-bunkazai which I want to introduce in the following. One of them (see picture 2) is owned by the Atsuta-jingû but preserved in the Tôkyô National Museum. It is also slender and elegant and almost ubu, that means it retains its deep koshizori and also its funbari. The kitae is a dense ko-itame in nashiji with ji-nie and a faint nie-utsuri. The hamon is a suguha-chô in ko-nie-deki that is mixed with ko-chôji, ko-midare, ko-ashi, and kinsuji and the bôshi is notare-komi with a somewhat pointed ko-maru-kaeri. The other jûyô-bunkazai (see picture 3) is preserved in the Konda-Hachimangû (誉田八幡宮, Ôsaka Prefecture). 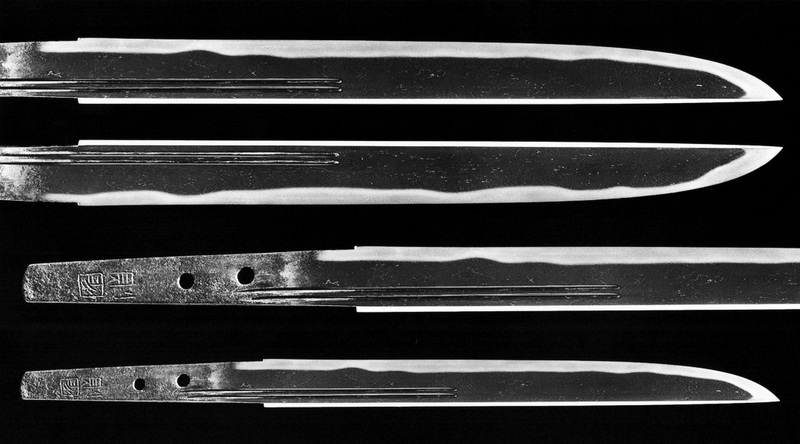 This tachi is with a nagasa of 81.1 cm rather long and has a wide and noticeably tapering mihaba (from 3.2 cm motohaba to 1.7 cm sakihaba), a koshizori, a thick kasane, plenty of niku, and a ko-kissaki. The kitae stands a little more out than at the aforementioned two blades and shows some masame towards the ha but is overall forged as itame with chikei and plenty of ji-nie. The hamon is a suguha in ko-nie-deki with a somewhat subdued nioiguchi that is mixed with ko-midare and many ko-ashi and that starts with a hint of yaki-otoshi. The bôshi is sugu with a wide ko-maru-kaeri and the tang is ubu and shows a shallow kurijiri. In addition, the name of the donator to the shrine is inlayed in gold in a carved out recess on the tang and the whole kinzôgan-mei reads “Ôhashi Nyûdô Shikibu Kyô Hô’in Ryûkei” (大橋入道式部卿法印竜慶, the donator) on the one, and “Kenjô Konda-Hachimangû moshi sejin kore o obau kami no bachi o ukubeki nari” (献上誉田八幡宮世人若奪之可受神罰也, “offered to the Konda-Hachimangû and if stolen, the stealer should receive divine punishment”) on the other side. Incidentally, Ôhashi Ryôkei (1582-1645) was a renowned calligrapher and tea master of the early Edo period. 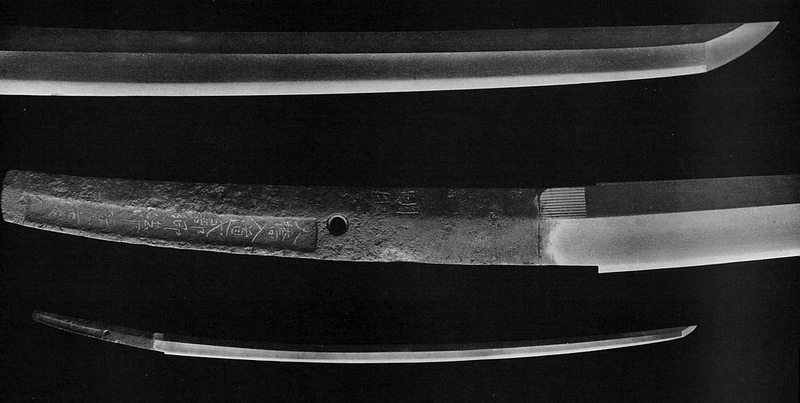 He served Hideyoshi and Ieyasu and the blade had been a family heirloom since the Muromachi period. The jûyô-bunkazai designation mentions that the tachi was handed down under the nickname Karigiri (鐘截, lit “temple bell cutter”) within the Ôhashi family. Picture 4 shows a signed tokubetsu-jûyô tachi that is ubu too, slender, and highly elegant. It shows a deep koshizori with funbari and a ko-kissaki and the kitae is an itame mixed with mokume that features plenty of ji-nie, chikei, and a faint nie-utsuri. The hamon is a hoso-suguha-chô in ko-nie-deki that is mixed with ko-midare, ko-chôji, ko-gunome, ashi, hotsure, uchinike, nijûba, and fine kinsuji. The bôshi is sugu and runs out as yakitsume. 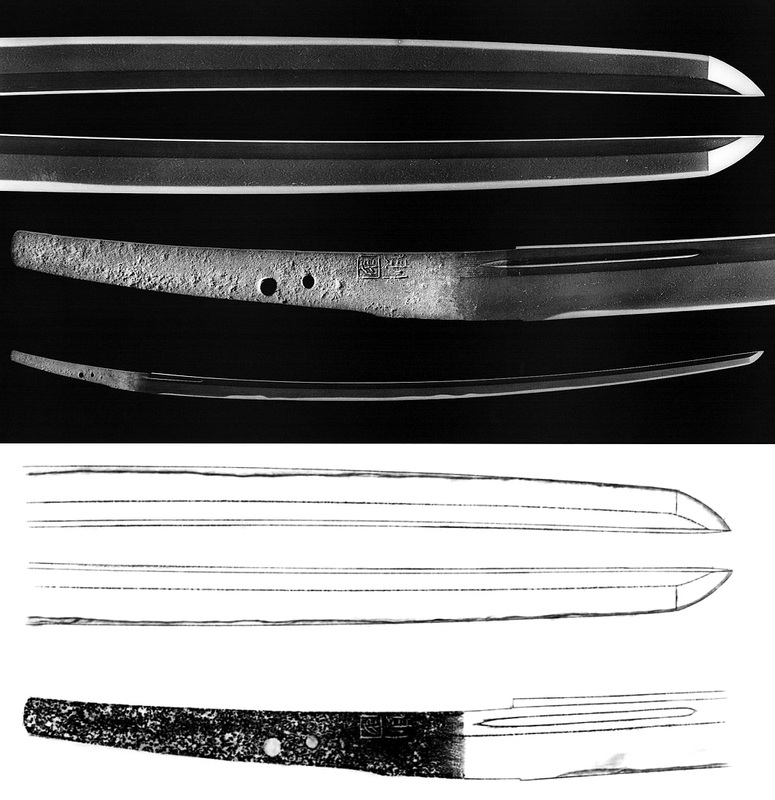 Please note that this blade too shows a brief yaki-otoshi and a thin and short koshibi just like the one on blade 2 by his father Kunitomo in the first Awataguchi chapter. And in direct comparison (see picture 5) the similarities become even more obvious (e.g. also the kijimono-style finish of the tang). By the way, this tachi of Norikuni had been a heirloom of the Kitabatake family since Kitabatake Akiie (北畠顕家, 1318-1338) had received it as a present from Emperor Godaigo. Picture 5: Comparison Kunitomo top, Norikuni bottom. Now to Norikuni’s tantô. A representative piece is the signed tokubetsu-jûyô (see picture 6) that ws once a heirloom of the Kuroda (黒田) family, the daimô of the Fukuoka fief (福岡藩) of Chikuzen province. The blade has normal proportions, i.e. mihaba and nagasa are neither wide nor sunnobi respectively, and an uchizori. The kitae is a dense ko-itame mixed with mokume and nagare and we see plenty of ji-nie and fine chikei. The hamon is a nie-laden suguha-chô to slightly undulating notare that is mixed with a conspicuous amount of ko-gunome, ko-ashi, and some nie-suji. The nioiguchi is rather wide and the bôshi is notare-komi with brief ko-maru-kaeri. Both sides show gomabashi which are close together and arranged more towards the mune, a feature that is typical for all Awataguchi horimono on tantô. And we find another Awataguchi featuere at Norikuni, namely that in many cases the smiths of this school added the exact same kind of horimono on each side whereas for their Rai colleagues engraved for example a suken on the omote and gomabashi on the ura side. 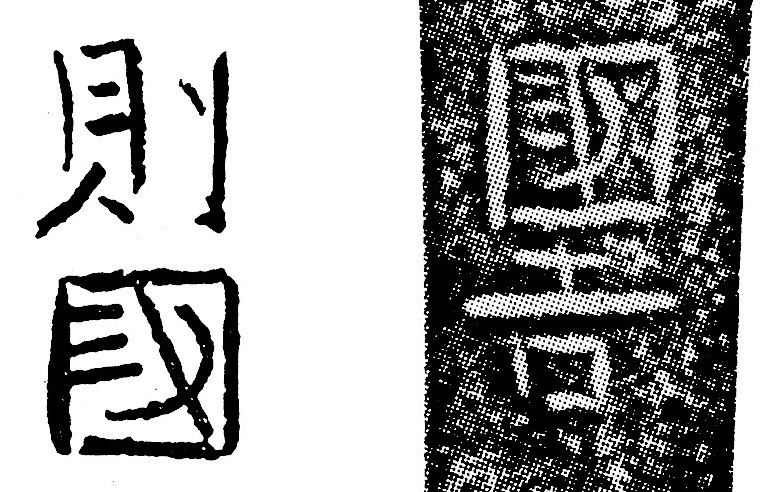 But there are also exceptions to this “rule” as seen at a tokubetsu-jûyô mumei tantô attributed to Norikuni that shows a suken on the omote and a shôbu-hi on the ura side. Last but not least it should not go unmentioned that again, we are facing slightly different signature styles but which are thought to go back to the different stages in the career of a single smith. There are somewhat larger and somewhat smaller mei and by trend we can say that he signed his tachi with a thinner chisel than his tantô which show a relative thickly chiselled signature. There was a ken of Norikuni discovered in recent years during repair works at a hall belonging to the Yokawa (横川) temple unit of the Enryaku-ji on Mt. Hiei that was hidden in a Buddhist statue. The ken (see link here) is now designated as cultural property of Takamatsu City, Kagawa Prefecture, as it is preserved in the local history museum and it shows the same thick mei as seen on tantô. Also interesting to note is that his character for “Kuni” is very similar to that of his son Kuniyoshi (see picture below). Both signed the left inner part of the box radical as three more or less horizontal and parallel strokes, met underneath by a pronounced arc that starts to the top right of the separating central stroke. Norikuni mei left, Kuniyoshi mei right.